Jonathan Hay Publicity: A Blast From The Past! We are digging in our own crates here at Jonathan Hay Publicity — and we found this amazing song you might have missed. A few years back, Jonathan Hay leaked a song he also titled called “A Divine Intervention at 55th”. A personal favorite of ours, this song finds Skinny Deville of Nappy Roots matched up with Dave Matthews. When we first leaked this song, the Dave Matthews fans jumped all over it — people were crazy about it. But, unfortunately, we immediately received an email from The Dave Matthews Band’s record label or management (I don’t exactly remember which designer suit or tie) insisting that we cease promotion on the song, stating that it was “unauthorized.” I don’t think Dave Matthews personally ever knew we were contacted to remove the song, as he was very cool with Nappy Roots. Even so, with the help of the internet, the song still managed to get out there but has since been removed from many of the websites and blogs it was featured on. We feel that good music should be heard. And great music should defy the rules. Bluntly put: we didn’t do anything wrong then…and we aren’t doing anything wrong now! 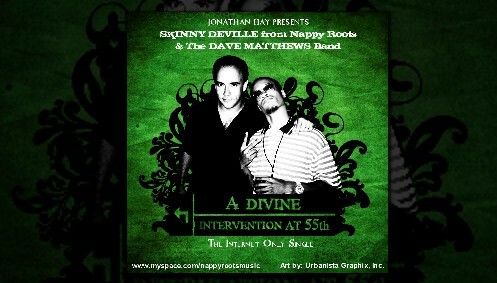 So go right now to www.hooplaworldwide.com/contact to listen to “A Divine Intervention at 55th”.